You couldn’t be more Vegas inspired if you tried with this exciting slot, which will transport you to the glamorous world of the Las Vegas strip in the spin of a reel here at Easy Slot. You will be surrounded by iconic casinos, prestigious hotels and everything Vegas is famous for. On the reels, you will see some familiar symbols which are associated with classic slot games traditional to land-based casinos as well as online slot games. 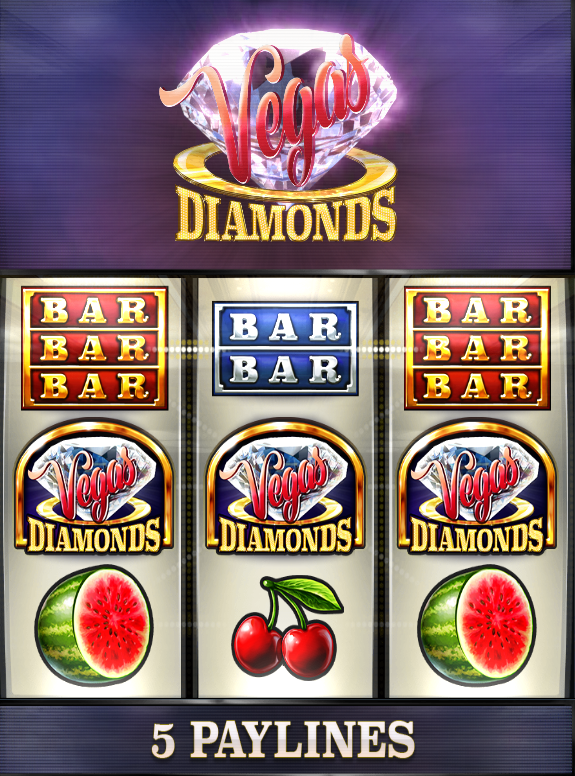 The fruit symbols, including cherries, watermelons and lemons are coupled with DOUBLE and TREBLE bars, which add to the classic look and feel of Vegas Diamonds. Not to mention the glittering Vegas Diamond symbol which is the true star of the show. What happens in Vegas stays in Vegas, so they say, but Vegas Diamonds is a slot game you’ll want to shout about. 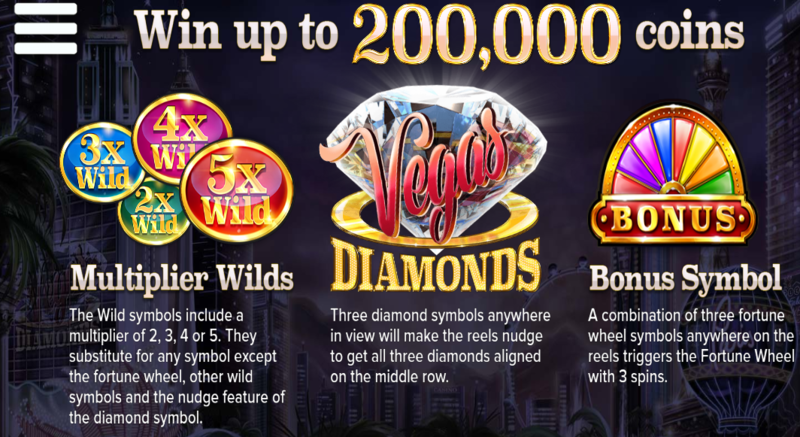 Vegas Diamonds is a classically laid out video uk slot game comprising 3 reels and 5 paylines. The game has a high variance as well as plenty of lucrative features to help you on your way to riches. Take advantage of the nudge feature in this game to edge towards fantastic cash prizes. The star of the show, the Vegas Diamonds symbol, is the most valuable symbol on the reel, so if you are lucky enough to land 3 Vegas Diamond symbols in any position on the reels, the nudge feature allows you to ‘nudge’ the symbols into place. The Perfect Match Respin feature will give you 2 respins of the third reel if you land two matching symbols on the first 2 reels, giving you the opportunity to match all 3 symbols. Another great game feature is the Fortune Wheel, which is triggered if you match 3 bonus symbols and you will be generously rewarded with a minimum of 3 winning spins on the Fortune Wheel. There are three tiers to the reel, Bronze, Silver and Gold, with the potential to win up to 1000 x your stake. Last but not least, the Free Spins feature gives you the opportunity to win 5 x your stake with a multiplier with 5 free spins. This exciting slot game is the third slot game in a classic All-American themed trio of slots which also include Ivanhoe and Route 777. Although Vegas Diamonds may be last, it certainly isn’t least. You can tune into the bright lights of Vegas whenever and wherever you are with this slot game, as it is optimised for smartphones and tablets as well as desktop play. If you love the classic look and feel when it comes to slots, you’ll love Vegas Diamonds as it embodies the traditional slot game with a contemporary twist. If you’ve been to Vegas before, this slot game will certainly make you reminisce about your time in Sin City. Witness the bright lights from the comfort of your own home on Easyslots.com.